This particular patch of scadoxus is looking very fine this week and stands around 140cm tall which is fairly remarkable given that it is growing in quite hard condtions. But then, scadoxus like dry shade and that is one thing we have in abundance in our garden. These are very large bulbs, hailing yet again from the bulb wonderland of Zimbabwe and South Africa. Mark has always described the flowers as being like the chimney brush of the bulb world because they resemble the round brushes used by old fashioned chimney sweeps. Katherinae flowers red in mid summer. Her cousin from Natal, Scadoxus puniceus, flowers orange in spring with a similar flower form. The foliage of both is large and lush. If you know of anybody with either variety, the seed will germinate readily. It is very slow to increase from the bulb (no doubt you could twin scale it) so it is normally done from seed. You are more likely to find bulbs of katherinae for sale rather than the rarer puniceus. This entry was posted in Plant collector and tagged Abbie Jury, plants for dry shade, Scadoxus puniceus, Scadoxus ssp. katherinae, The plant collector on 12 February 2010 by Abbie Jury. 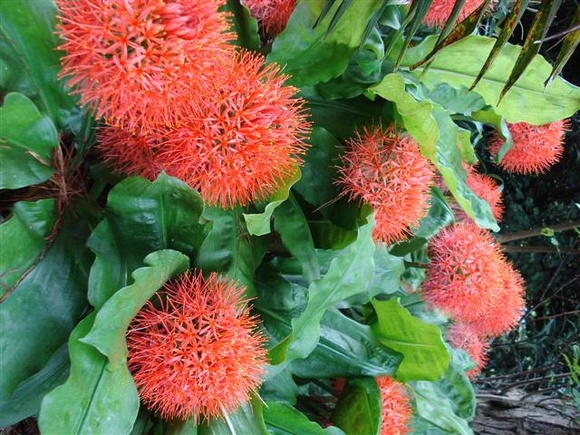 I am very keen to purchase a scadoxus multiflorus plant (or 2). Do you happen to sell the plants or bulbs or know where I can go to buy them. Thanks Jennie. We will have them shortly – I just have not potted them yet. But we do not mail order plants at all so they would need to be collected from the nursery. I have no idea who else is selling them, I am afraid, but they are not particularly rare so they should be available from others as well, particularly in the north.